Over 60 years ago, Costa Rica became one of the only nations in the world to disband their military and to re-direct national resources towards education, health and the environment. Since then, Costa Rica has earned the number one spot in the Happy Planet Index, a ranking of countries based on measures of environmental protection and the happiness and health of its citizens. And the World Database of Happiness, with data on 149 nations compiled by a Dutch sociologist, lists Costa Rica as number one in self-reported happiness and number one in happy life years. “Costa Rica is now nearly seven decades into what may be the most extraordinary experiment a sovereign nation has ever undertaken. A Bold Peace tells the story of Costa Rica’s risky, extraordinary journey of living without a military — of transcending war and remaining (for 68 years and counting) an example of the future that is possible for the whole planet… Part of the film’s impact is the clarity with which it explains, through numerous interviews, the complexity of Costa Rica’s peace journey and the courage required over the decades to sustain it… Yes, there is another way for the world to live. By the film’s end, this way emerges not simply as possible, not simply as a curiosity, but as the model for the future. It’s time for the rest of the world to join Costa Rica on its journey.” Robert Koehler, Huffington Post. Koehler’s review was reposted on over 15 websites including Common Dreams, Truth-Out.org, and Counterpunch. 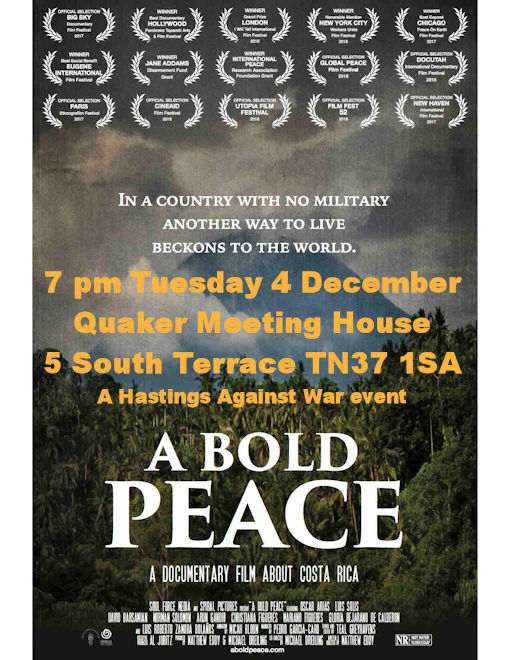 Tuesday 4 December 2018 at 7pm, organised by Hastings Against War. Quaker Meeting House, 5 South Terrace, Hastings TN37 1SA. Free event. Easy access for all. Bring a seasonal snack to share. “Costa Rica’s Peace Journey,” Huffington Post, February 23, 2017. Robert Koehler. Would love to have seen thisbut couldn’t make that date. Will it be shown again? Maybe at the Electric Palace?